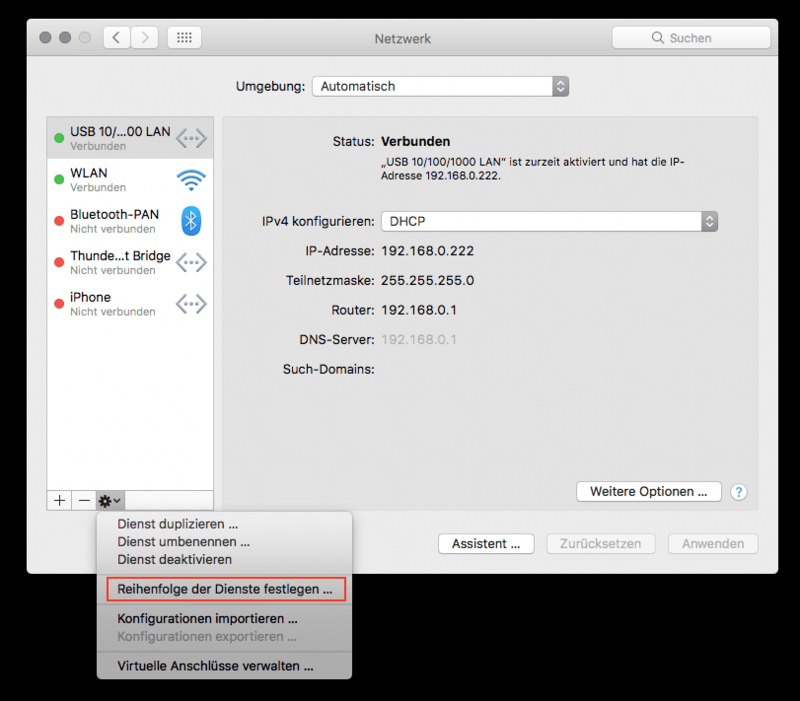 If you are working with a MacBook Pro or similar you usually have really fast wifi but there are still situations, where a wired network connection is preferred like working with images from a NAS like in my case. To get the fastest connection possible, I bought a USB3 to gigabit ethernet adapter which is plugged in when I am working on my desk at home. Disabling the wifi connection isn’t an option because this would also disable AirDrop and other features I use often. So how can this “problem” be solved? The solution is very “Mac like”: Just open System preferences, go to Network and click on the little gear at the bottom of the interface list then select “set service order” (see image below). By dragging the wired connection on the first position, followed by the wifi connection your Mac will prefer the fast connection for anything network related but gives you still all the features which depend on the wifi connection!